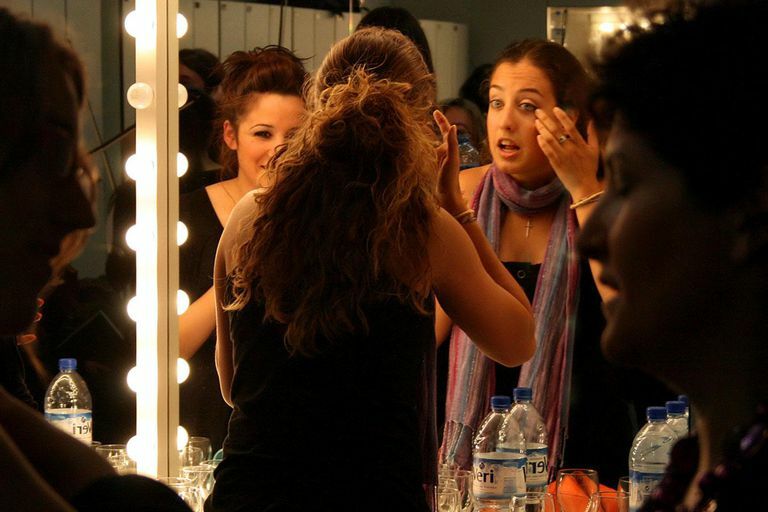 While larger groups or organizations will include a stage makeup artist, if you're performing for a smaller group or venue, it's not unusual for you to be expected to do your own makeup. In some cases, a makeup artist may 'design' the look for your production, and you will then recreate that look on an ongoing basis for performance. Either way, it's essential to learn the art of applying stage makeup and to be able to do so skillfully, and in service to the character, you're playing. It's also important to use real, professional stage makeup created for the purpose. Popular brands include Ben Nye, Mehron, and Kryolan. Wash your face thoroughly, taking extra care to exfoliate. Follow with a toner, and moisturize afterward to create a clean, smooth base for your makeup. Apply your foundation in a color that both matches and evens out your skin tone. For reddish complexions, choose a foundation with a slight golden or yellow undertone. However, even for warmer complexions, remember that the stage lights will tend to wash out or add a 'colder' effect to colors, so go warmer in tone wherever you can to counteract this (unless the character you're playing is meant to be wan, sickly or ghostly, in which case, stick with cold, pale tones!). Use a sponge or foundation brush to apply your base, for more even coverage. Make sure to blend evenly into the hairline, at temples, and slightly below the jawline. Take extra care that your jawline color blends naturally into your neck -- there's nothing more distracting than someone whose face contrasts starkly with a neck that's a completely different color. Stage lighting tends to 'flatten' a face and remove definition. Add contour, character, and definition to your face using a darker cream. Go darker for whatever you want to 'recede' or hollow on your face. Enhance cheekbones with color that starts just below the cheekbone itself, and which is concentrated in the 'hollow.' Start the color at the point in your cheek that is slightly outside the center of your eye, then back on each side. Reduce plumpness and strengthen your jawline by adding color in a direct, subtle line of shadow from chin to the bottom edge of each side of your jaw. Add shadow to the eyes by using cream along the curve of the socket. For a wide-eyed, open look, add highlights using pale cream colors to the center of the lids and browbones. Line the eyes with a thin, firm line above the upper lashes, and with a thinner line below the lower ones. Widen and deepen the line from the center of the eye as it sweeps outward on each side. For dramatic or colorful roles, use black, thick lines. For men, younger performers, or those seeking a more natural look, use browns, experimenting with shades to emphasize the eye without looking overdone. Carefully extend your eyeliner up and outward beyond the edge of your eye. If you do this properly, when the eye is open wide, this line merges with the line of your lashes, simply adding a subtle lift and openness to the eye. Emphasize the eye sockets with more shadow, as needed, as well. Use liberal mascara and/or false eyelashes, as desired. Draw natural, firm brows with a high arch (a good arch on the brow really frames the face). Line the mouth with a firm, dark line that enhances the natural shape of your mouth. Don't go overboard here -- the object isn't to create a completely different mouth shape but to strengthen what you have naturally. Use a color that's in keeping with your character -- a lighter one for the men, or in the women, for a more natural or innocent character, and a darker deeper tone for a femme fatale or more dramatic character. Powder your entire face thoroughly. It will 'set' your makeup and provide a more naturalistic finish. Reapply powder as needed throughout the show. In dress rehearsals, get feedback on your makeup from house level, to see how it plays, and tweak as needed for more or less boldness in your application. After the show, remove your makeup no matter how tired you are, for the health of your skin (not to mention your pillowcase!). Use a cream or oil-based makeup remover on the eyes (not soap), and a good cleanser on your face. Use an astringent or toner on a pad or cotton swab to fully remove any last traces of makeup. Finish with a good moisturizer. You now have two choices: Get some rest, or start all over again by applying your everyday makeup so you can go back out. When playing to small venues, go for just slight exaggeration -- don't overdo it. For larger venues, go with a slightly darker foundation, and more exaggerated lines. Meanwhile, if you're playing at a small venue or an intimate three-quarter round, keep your makeup fairly subtle and 'street' worthy. Use real stage makeup, real greasepaint. Yes, it's oily and thick-feeling. But it's the only thing that will stand up to the heat of the lights and the stress of performance. Water-based makeups will fade and run quickly under the lights. If you're playing younger, use contour makeup skillfully to make your upper eyelids rounder. Open up the eyes with liner, and emphasize the apples of the cheeks, not the hollows. If you are playing a gaunt, old, or frail character, be sure to shadow and contour the hollows at temples, eye sockets, cheekbones, and jawline, as well as the lines on either side of the nose from nose to mouth.